Hey ya'll! So, remember a month ago when I debuted the new stair rail? Well, I truly thought I would be able to get everything painted in a week or so. And then it basically took me a month to get it all finished. I've come to accept that this will never be a blog that makes things look quick and easy. Welcome to the opposite blog. Take off your shoes. Stay awhile. Enjoy the disaster that unfolds in every post. 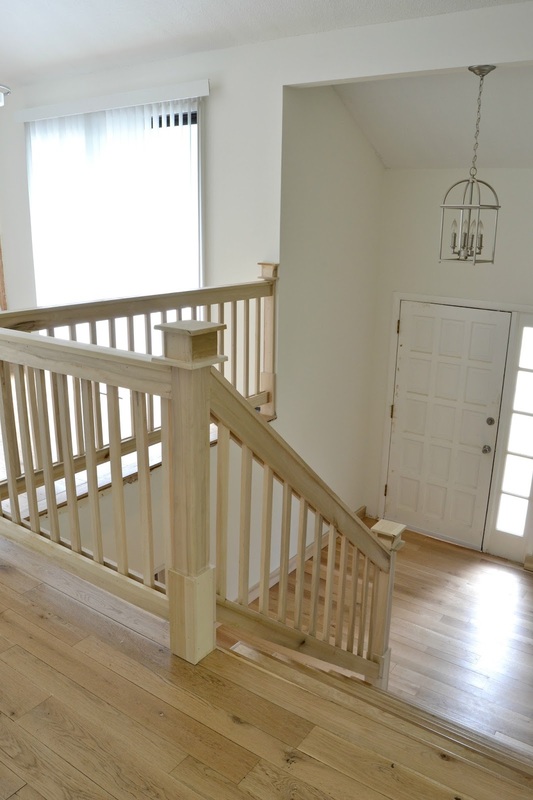 So anyways, let's rewind a little bit and remind you what the new stair rail looked like after it was first built. 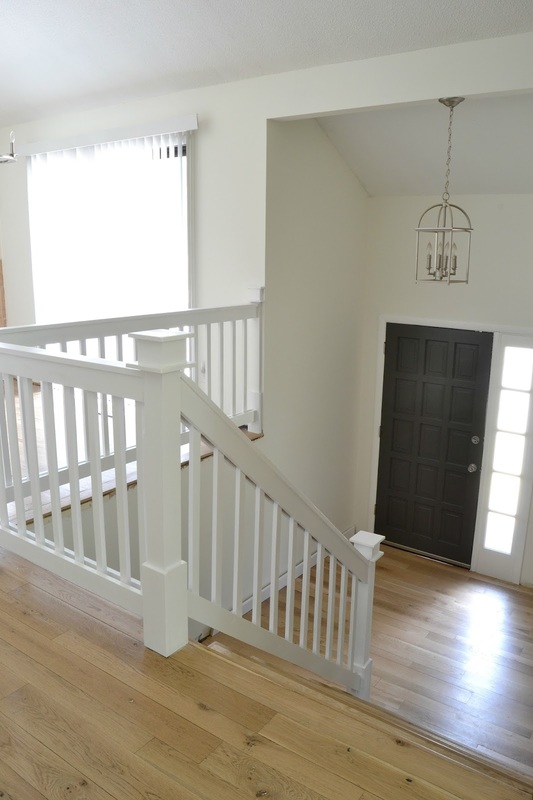 A few of you suggested leaving the railing as the raw wood and just adding a topcoat, but we built the stair rail using wood that wasn't all uniform, knowing that we wanted to paint it to match the trim. Here's a close up of the railing to show you what I mean. So, knowing that it had to be painted, I decided that I wanted to paint the stair rail using our new paint sprayer, thinking that it would make the painting process a total breeze. Welcome to my worst idea ever. Also known as that one time I turned my house into the set of Dexter. Since I had never used a paint sprayer before, I had no idea how much overspray was involved. When I took the sprayer outside to test it for the first time, we quickly realized that I was going to have to cover the entire first floor with plastic. 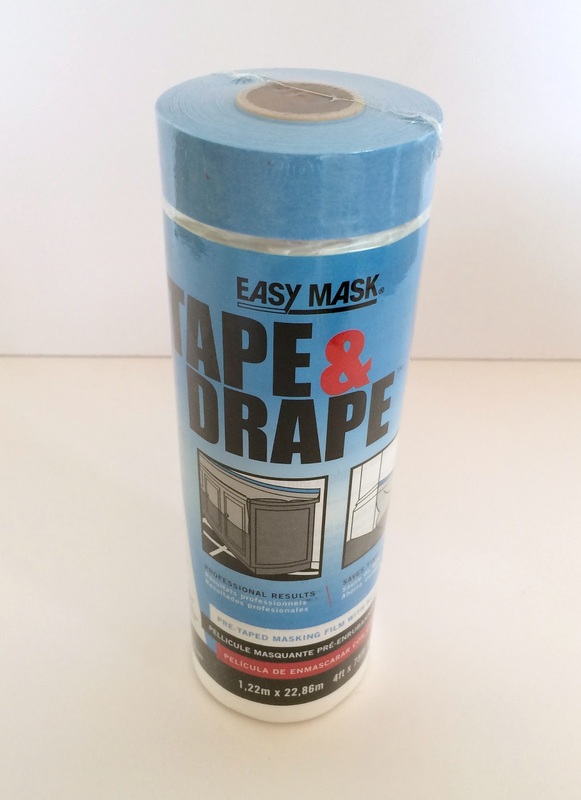 So, I used this stuff called Tape'n Drape (affiliate link), which is basically a bunch of plastic sheeting attached to tape. It made things so much easier, but it still took me about 3 hours to tape everything up. Only because I tend to turn into a fly stuck on a fly strip whenever tape is involved. So, we played with the paint sprayer for awhile outside, making sure we had a general understanding of how to use the thing. 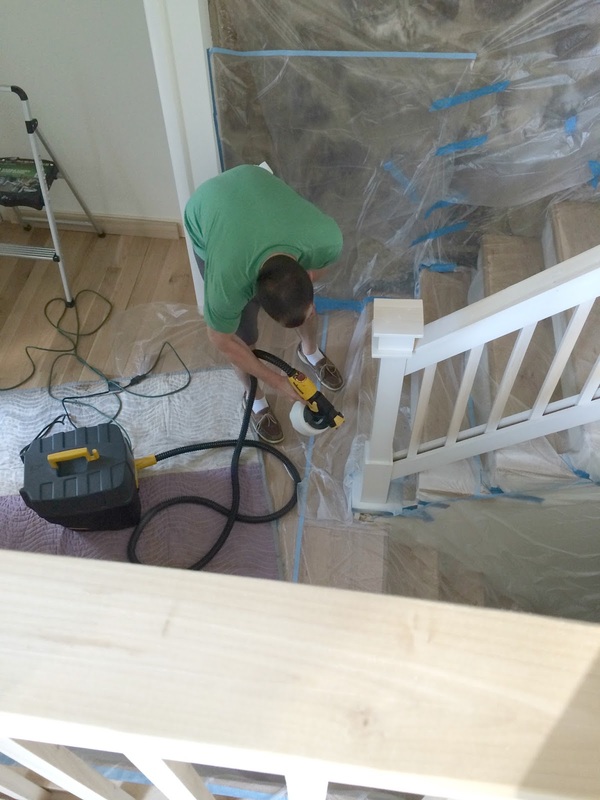 And then it was time to tackle the stair rail. I applied the first coat of primer to the area near the stairs, and frankly, it wasn't as easy as I thought it would be. Jesse witnessed me struggling and offered to help. And that's when I handcuffed him to the paint sprayer. Luckily, I came up with a nice plan to hold a sheet of foam board on the other side of the rail while spraying to stop some of the overspray. This sped things up and eventually the entire railing was covered in a coat of primer and 2 coats of semi-gloss paint. For those of you who like specifics: First I used wood filler on all of the nail holes and then sanded them flush with the wood. Then, I caulked all of the gaps in the wood with DAP. Then, we used Kilz primer and Behr Premium Plus paint in Ultra Pure White with a semi-gloss finish. And I sanded the entire thing with 220 grit before priming and then again after the primer had dried. So, if I'm being honest, Jesse basically just painted the whole thing. I mostly ran around like a crazy person checking for overspray evidence. Wearing oversized man pants and a mask, staring at a flip flop. 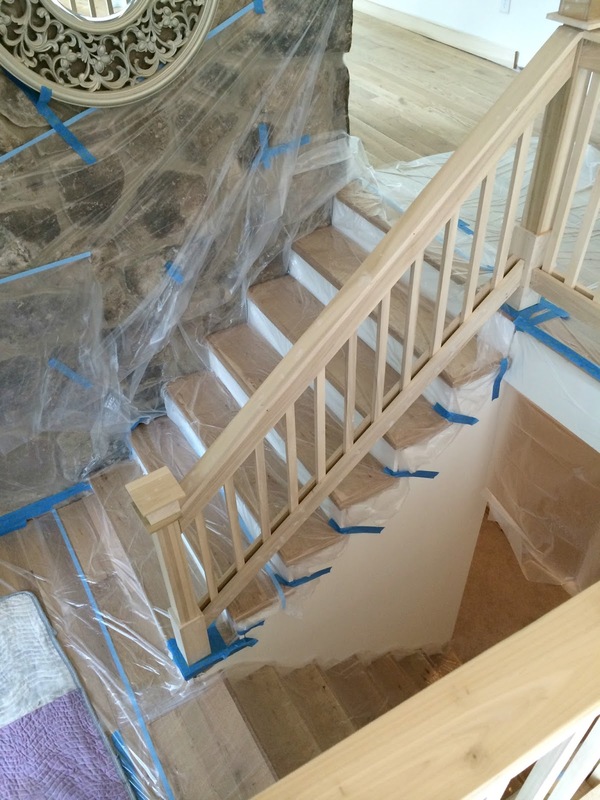 Eventually, the stair rail seemed to be adequately covered and the job seemed done. It was dark at this point, but as far as we could tell, everything looked great. So, we pulled up all of the plastic sheeting and went to sleep. And here's where the plot thickens. I woke up the next day and it was incredibly evident that we should have applied one more coat of paint. I wanted to run away. And never return. 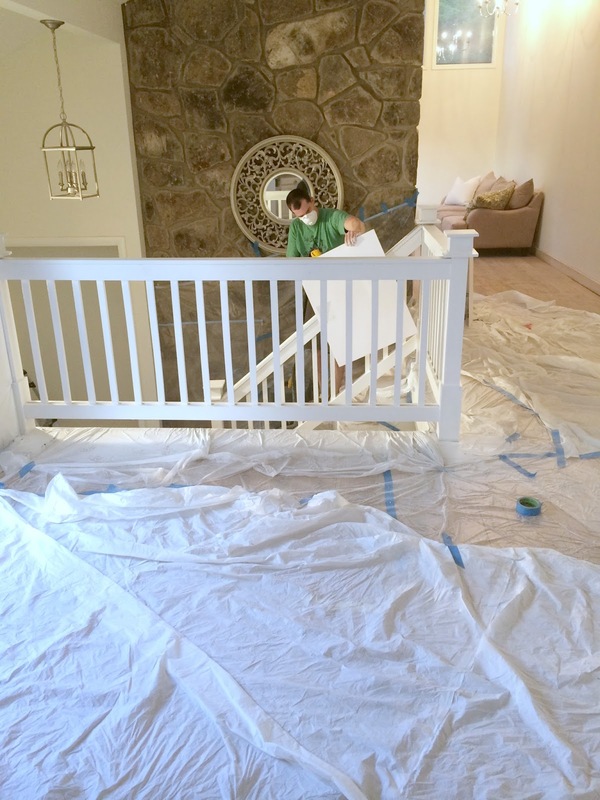 And since there's no way I was going to recreate the taping and draping incident, or ask Jesse to enjoy another fun-filled day with a paint sprayer, I spent a few long evenings with a paintbrush and tiny foam roller applying one last coat. There were a few moments where I felt a little Britney-with-umbrella-crazy, but in the end, fine tuning the last coat wasn't the worst thing in the world. Eventually the stair rail was totally done, it looked great, my sanity somehow survived, and it was time to move on to the door. The door was a total disaster after the stain debacle, and definitely needed a new coat of paint. I realize how gross that is. So, I set up my shower curtain dropcloth, wiped down the door, sanded it a little, and started testing out some black paint colors. I eventually settled on Sherwin Williams Urbane Bronze, a really great subdued black that goes really well with just about anything. And then I also replaced the old hinges, door knob, deadbolt, and door sweep with upgraded satin nickel ones. That alone made a big difference. 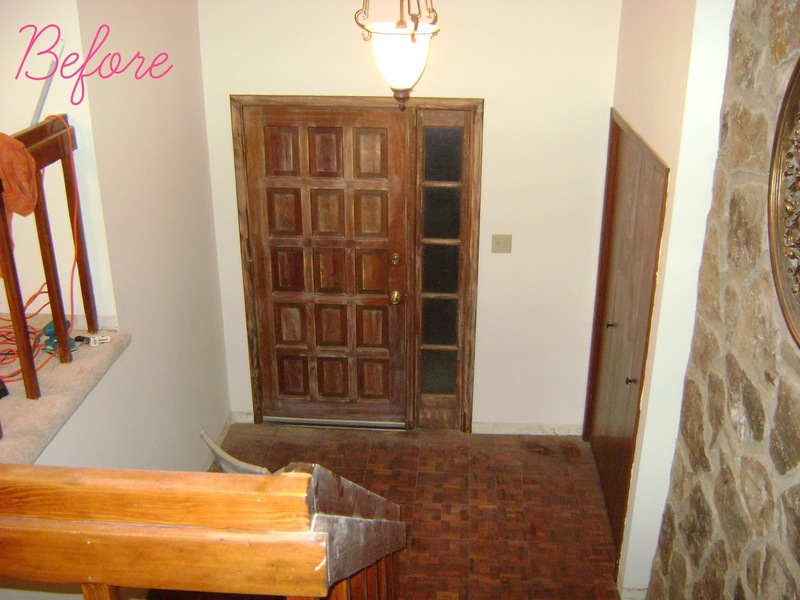 Now all that's left in the entryway is to install trim around the floors and stairs, find a rug, and re-assemble the nook. But for now, I'm just so happy with this little space. I've questioned myself a lot during this renovation, so it's a nice feeling to just love something right from the start. Plus, all it takes is a tiny little glance at this before picture to remember just how far this little area has come. We've painted the walls, painted the door, replaced the floors, replaced the stairs, built a new stair rail, upgraded the light fixture and door hardware, replaced the switch plate, and converted the closet into a nook. And soon, there will be brand new trim. And I have one more before picture that's totally embarrassing, but kinda hilarious. And it reminds me that I'm going to fail a lot before I ever succeed. And that's how it's supposed to be. This is a picture of the entryway nook from about 4 years ago when I first decided to take off the closet doors. I remember thinking it was brilliant, and I remember Jesse mentioning that it would make a nice puppet theatre. So, anyways, to those of you who write me and say that you don't know where to start....the answer is somewhere. Start somewhere, make mistakes, keep going, and you'll be surprised at how much you can do! And that's all for today, ya'll! I'll be back soon to share whichever one of my ongoing projects I finish up next! :) 'Til then! Virginia, it looks fantastic! I'm a first time commenter who just bought a new townhouse. It was built in the 90s so slightly more modern but was left mostly builder-grade by its first owners so we have a LOT of updates to do to the bedrooms and stairs (carpeted), the laminate in the basement (popping up), and the kitchen (just...terrible). 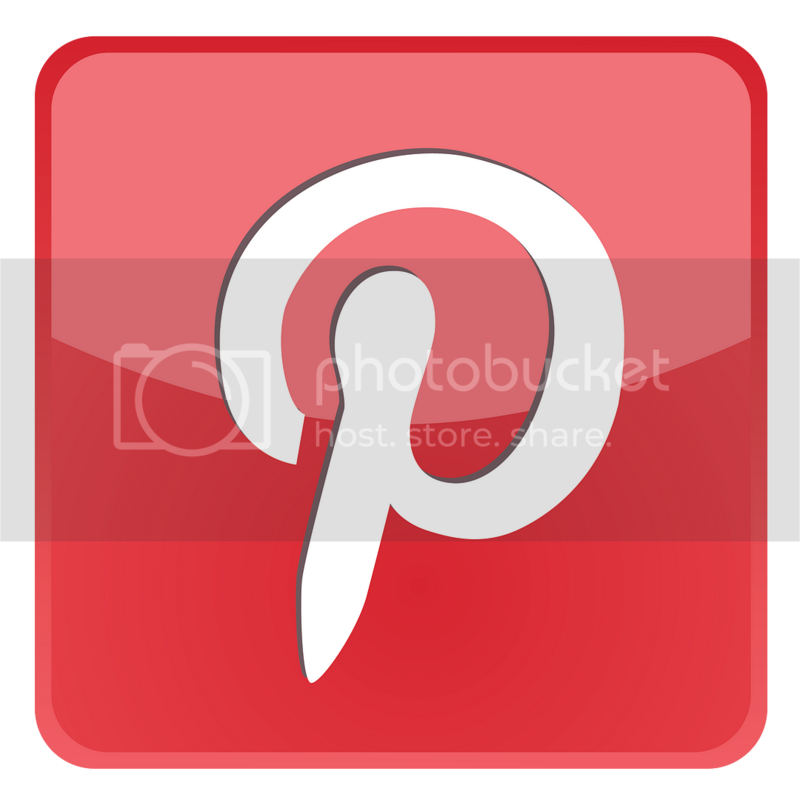 Your blog has been a great inspiration for me, even while we were buying, to believe that I can DIY some of these updates. Thanks for that and keep it up, lady! Your house looks beautiful! Thanks so much, Danielle! Congrats on your new townhouse! So exciting! You are turning this into the most amazing home. I love how light and bright it is. Great job so far. It looks amazing!!!! I love how you write, it makes me laugh every single time! I LOVE it! I'm so impressed (and inspired, but my husband says "Don't you dare." I'm only allowed to redo furniture at this point... not our home. Baby steps.) You are hilarious! I always enjoy your posts! Seriously, I love your blog. You keep it real, girl!!! It looks fab. I don't know if this is your style but when I was admiring your photos I thought that light fixture would look good with one of those orbs. I found these two tutorials yesterday...http://designertrapped.com/2014/04/west-elm-bentwood-pendant-light-knockoff.html & http://www.lovelyetc.com/2014/04/easy-inexpensive-diy-orb-chandelier/ Keep up the great work! I am really enjoying your renovation! You are doing a wonderful job. Over the years my husband and I have tackled many projects...along the way building a house ourselves. We have learned to do electrical, plumbing, my husband even took a brick laying class so he could make the two story (two fireplaces) chimney himself. That was 38 years ago when we were much, much younger. We still live in our much loved home and are still finding projects...it never ends.I love your honesty about gliches and mistakes..... I have underestimated so many times...and have learned the hard way that nothing that is done well is easy. I look forward to the rest of your saga! Oh, wow! Brick laying classes...now that's commitment!! I love it! You two sound amazing! Last time when you talked about spray painting the railings I had heart palpitations. I was picturing overspray on the floors, stone etc. Oh God, she's going to learn to spray paint on a staircase??? I'm sorry, but I was really prepared for another disaster story. But looks good! And only a minor glitch! It looks amazing - I feel your pain as we recently painted our railing and we didn't have half the amount of rungs to paint. It really is more work than it looks - Congrats on getting it done! It really is! I thought it would be SO much easier than it was! But, I'm pretty sure I think that before every project. Every. Single. One. You are hilarious!!! I love reading your blog and get so inspired and I don't even own a home! Well done friend! Oh, Virginia. You make me literally laugh out loud with every post. I love your wit and sense of humor. Keep it up. 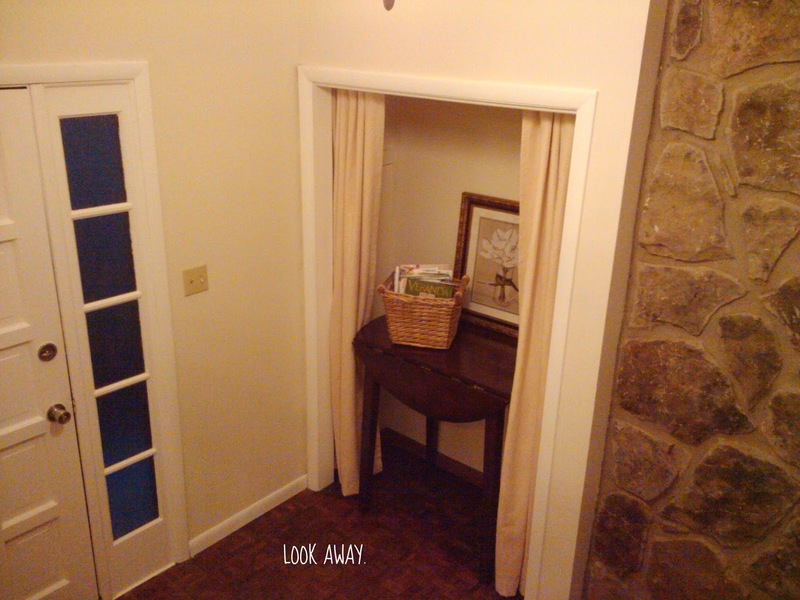 Aaaand, your entryway looks absolutely gorgeous. That house is going to be in a magazine when you're finished. Mark my words. :) Can't wait to see what you do next. I laughed out loud at the picture of you staring at the flip flop! I have so been there. I'm great at coming up with ideas, prep work and cleanup, but hubby almost always ends up swooping in and doing the grunt work while I pester him and run around doing not much of anything. I love the direction your home is taking! Looking forward to seeing more. Thanks Krista! I'm so glad you guys can appreciate my flip flop moment. I love that you decided to paint the door black! Love, love, love the way it looks!! And isn't that the way with all home projects - taking twice as long as expected?! Looks great! I too live in a bi level home where you are faced with stairs when you walk in. Where do you hang your coats without the closet? 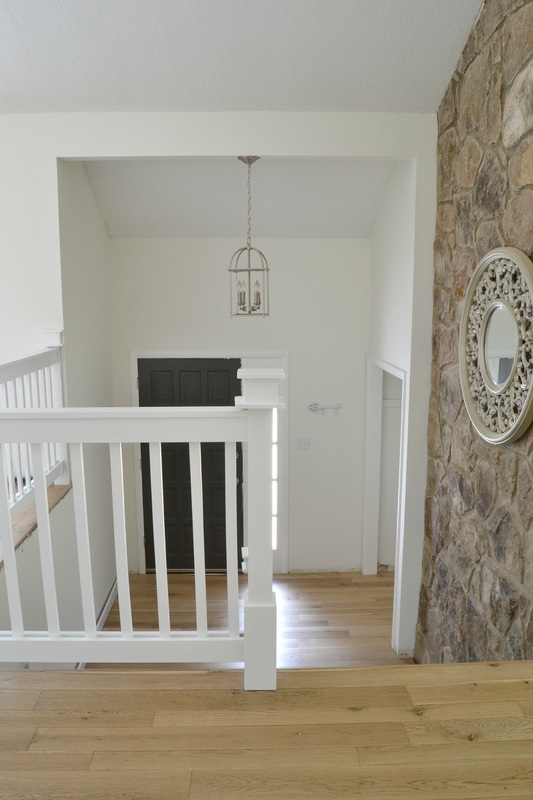 Looking at your nook reveal, I notice the Houzz photo and your photoshop idea of black stair treads - any thought you might go ahead with that??? Looked amazing. Maybe you just want time Away From The Paintbrush for a while? Reading your posts always makes me feel better about myself... in that "Hey, we're in there together, girlfriend" kind of way. 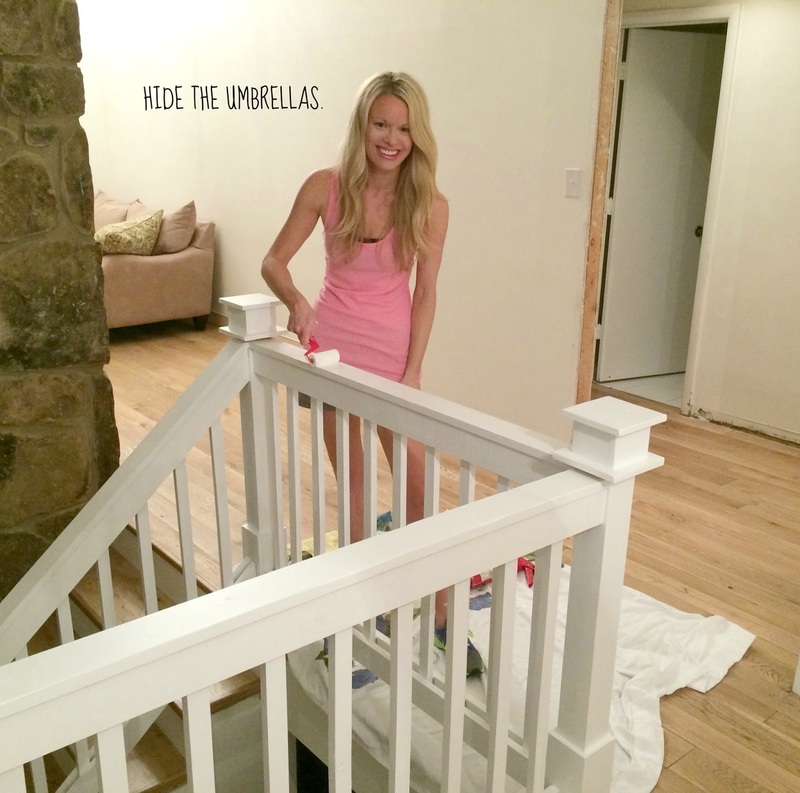 I have made SO many mistakes on my DIY projects and I always want to run and hide. You make me want to embrace it, so thank you for reminding me that it's part of the journey. 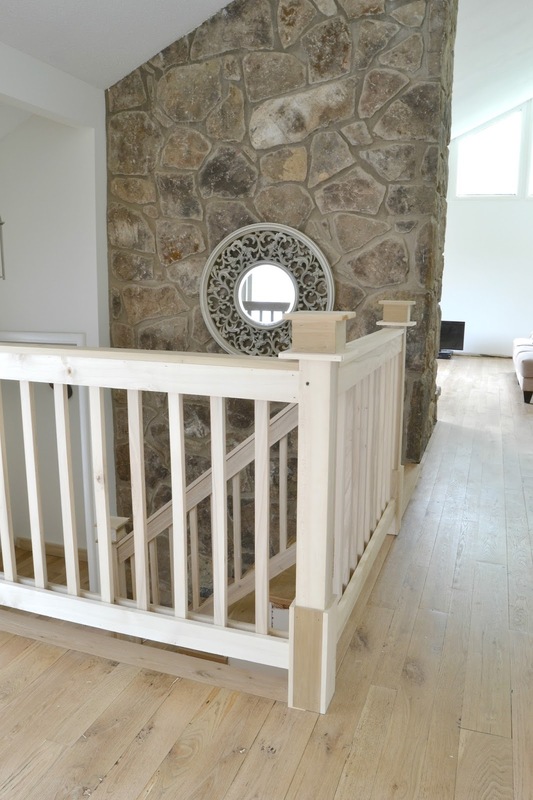 That stair rail looks fabulous! The railing and door look lovely! I am always impressed that you keep plowing through. It gives me courage to actually finish stuff (even if it is awful on the first try). Looks great! very fresh and new. Love all the changes! Everything looks so finished now that the railing is done. Also love the dark door against your otherwise light color schemes, I think it's makes a nice focal point. Question, since I see you've moved all your furniture back into your living room, are you having trouble with your couches sliding around under the new floors (or any piece of furniture)? If so, have you found any ways to help the situation? Thanks! It all looks great Virginia, particularly the black door. ! I'm so pleased that you write about your "fails" as well as your successes as some bloggers make it look too easy. I remember tackling jobs that I thought would take a Saturday morning that were still keeping me busy three weekends later! Thanks for blogging, and sharing it as it happens. Virginia, I LOVE your blog! It gives me hope that my little home has potential. Thanks for making us all feel a little more sane as we DIY! 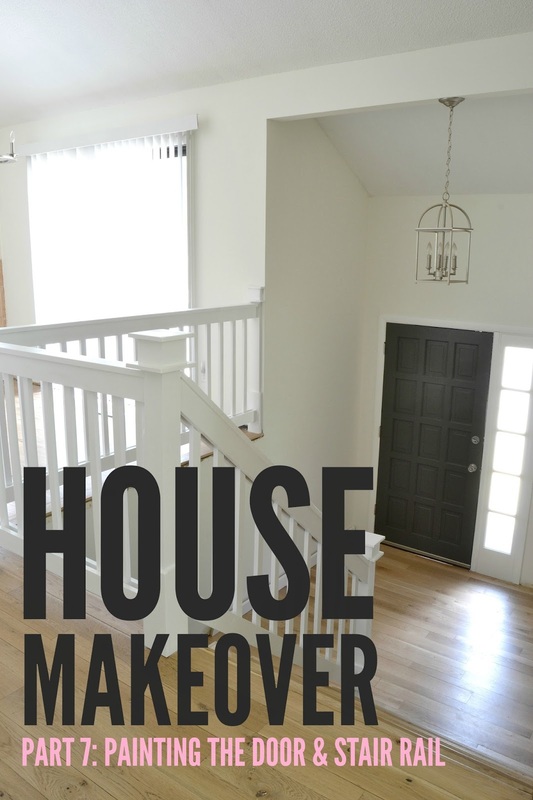 Love seeing your house transform. 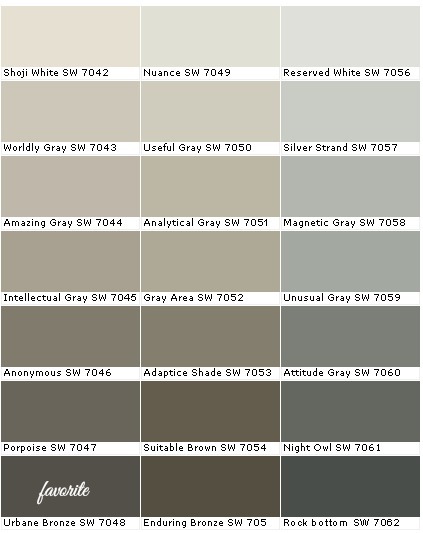 I don't know how you can even stand to look at paint anymore lol. I paint a room and I think, yep, there's my painting fix for about 2 years! Lol. The house looks amazing! I should start on mine...as soon as the outside projects get finished...if that's even really ever possible. Bwahaha. I paint in flip flops too. I have a special pair and everything. People usually look at me like I'm insane. I thought I was the only one. I love your blog!! Thank you so much for sharing every mistake, misstep and snag that comes along. You are an inspiration, and proof that if you just keep plugging along, eventually things will look as you want them to! My very handy husband rarely lets me do anything involving tools or paint, but I recently chalk painted some of my daughter's furniture and it looks amazing! (Even though he thinks it's 'temporary', mostly because it was TOO easy, with no priming, sanding, LOL.) Anyway, keep up the great work and keep it real, girl! I love you! Do you need to take off the door to paint? What about switching out the hinges - is that hard to do? Hi Virginia....Lovely how it turned out!! My home has the same kind of top to bottom rock fireplace...I see you have that awesome mirror in it. Been wanting to put up a mirror...How did you place it there? Nails?? As you can tell. I. am. a. newbie!